Mothers Day Gifts:Community Coffee Gift Set Giveaway CLOSED! Mothers Day is on May 8th this year and the way time flies, it will be here before you know it. Mom is very important and we all have a obligation to make her feel special on the one day set aside to praise her every year. I know personally, being a mom I want to be able to get up in the morning of Mothers Day with out having a alarm waking me up. I want to be able to wake up when I am ready to wake up. I dont want to have to wake up to chores and having to make the coffee and breakfast. I want to wake up and have my breakfast ready for me and a nice fresh cup of coffee ready for me as well. I dont think that I am asking for too much. And I know that other moms out there feel me and understand what I am talking about. A day for me. I am glad that my husband makes my Mothers Day wish happen every year. I am also pleased to know that my dad will be doing the same for my mom since my sister and I are so far away from her on her day. Even though we are so far away we still make Mothers Day special for our mom. Thats what is so great about Community Coffee. My mom loves her coffee just like I do, and with Community Coffee I can order my mom a gift pack and have it delivered to her for her to enjoy on Mothers Day. This year I was given a Mom On The Go Gift Pack for Mothers Day to review for my readers. This gift pack is great. 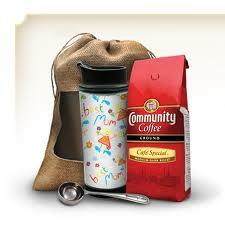 It comes with a bag of coffee in a small burlap sack, a coffee scooper and a travel mug that you can customize. My mom is a mom on the go, even though her kids are grown and in different states, she is always on the go. She is a actress, high school drama teacher, and student going for her PHD. So like I said she is always on the go. She not only loves to hear from me and my sister, but she cherishes those phone calls from the grand kids. She also cherishes the gifts they give her. Just like she did when we were little, she saves the little pieces of artwork that they give her. I think that those personal touches of love that my kids put into their homemade gifts to her mean more than anything. So when I was asked to choose which gift set I wanted to review for my readers I knew I had to go with the Mom On The Go Gift Pack. My kids are in the process now of personalizing the travel mug. We are going to put the travel mug back in the pack once the masterpiece is complete and ship it to grandma for Mothers Day. That way grandma can show off the work of art to her students and colleagues as well as her friends. I know my mom and she will really appreciate this set, your mom can too! The wonderful people over at Community Coffee would like to give one of my amazing readers their own Mom On The Go Gift Pack!!! Like Community Coffee on Facebook, then come back here and leave me your email with this entry!!!! This giveaway is open to US residents. This giveaway will end at midnight on April 29,2011. Winner will be chosen at random.org and will be given 48 hours before another winner will be chosen. All products for reviews and giveaways are given as a sample from the companies. All opinions in reviews I conduct are my own. I was not paid to say anthing or review any products. Previous Post Mothers Day Gifts: Brugo Giveaway CLOSED! Next Post Mothers Day Gifts: Tassimo Brewer Giveaway CLOSED! I like CC on FB- email in profile.